Battling Burrows: You! With a dirty Chink! Lucy Burrows: 'Tain't nothin' wrong! 'Tain't nothin' wrong! I fell down in the doorway and - it wasn't nothin' wrong! Battling Burrows: I'll learn yer! I'll learn yer! Beyond the weepy, sappy, tear-jerking qualities associated with this Griffith feature, it's actually a landmark film in the annals of feminist films. In a time when women were either out on the street turning tricks, or in the home raising children, this film looks at Lucy Burrows (Miss Gish) who seems to be caught in the middle. Of both the above characteristics of period women, and literally caught between an abusive parental figure, and a caring oriental shop keeper. The question is posed...should she sustain the abuse and stay in the home, or be a social reject by shacking up with this "lowly chinaman"? As in all of Griffith's films, the women are either virtuous or fallen, and the men are either lusting brutes, or effeminate sensitive males. Many may look aghast at the legendary Barthelmess playing the chinaman, Cheng Huan, or any one of a number of races played by white actors. 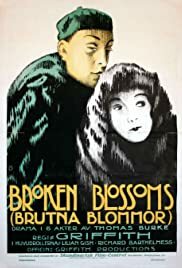 If not anything else, Blossoms is a great example of stereotypes that existed in the early years of cinema. Griffith successfully deals with the race issues, (even with the use of white actors in the various race roles), extreme masculinity issues, and the above stated femininity issues bluntly, and straight to the point. In a culture dominated by the MASTER NARRATIVE of patriarchal while heterosexual males (well, even still today), D.W. tries his best to put it into perspective. And does a pretty good job of it.